New Zealand with its hills and lack of bicycle lanes was not exactly the ideal bicycle country, though it must be said that lots of younger tourists have traversed New Zealand by pushbike without too much trouble. the design is smart, the technology is advanced and the savings for the user significant compared to using the car for the short trips. You could argue that you would use a bike for the exercise and the electric one could not offer you the same calorie burn, but the experts disagree because, they say, that the standard pushbike only gets used once or twice a week and a third once a fortnight or less. Recent survey of electric bike usage shows that one third of owners use their electric bike once a day and 81% at least once a week. That rather adds up to the electric bike getting twice the usage of the conventional one, and research confirms that regular light exercise provides the health and weight advantages. 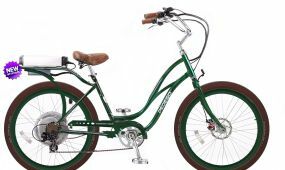 So what is the difference between an electric bicycle and the well known iron horse? Three things sets it apart: The Lithium battery, the display panel where you set the power level, and the electric motor built into the wheel hub. There are a number of different models to choose from and several manufacturers’ makes, more overseas than here as yet, but most bikes are made in China or Taiwan where el-bikes are popular, so popular in fact that in China alone some 120 million of them whizz round the towns and cities. 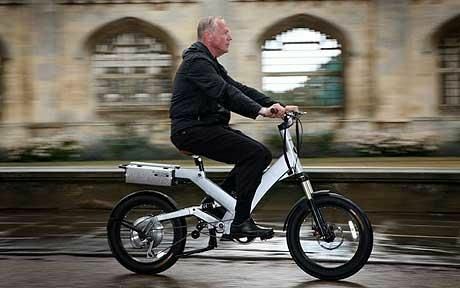 Last year in Germany 500,000 el-bikes were sold, and in Holland one in ten household now own an el-bike. In the Nordic countries it has also been taken to heart with around 100 different models available, from ladies style to high class types, one with the batteries hidden in the frame by a high-end Spanish producer. Running costs are low since charging the batteries is cheap and quality lithium batteries lasts for years and degrade only slowly. They are also recyclable. Your savings include parking fees, running costs of the car or other transport costs. Costs run from about $2500 to over $3000. It should be noted, however, that some el-bike models make use of lead/acid batteries which adds quite a bit to the weight of the bike and so is less suitable for our type of hilly country side, but usually makes the bike a good deal cheaper than the lithium battery powered models. Another advantage over conventional bikes claimed by the makers of the el-bikes is the freedom and mobility enjoyed and an extension to your cycling years, plus that of arriving at work or social occasion without the perspiration. And because you are going faster it is nicer on a hot day to have the wind in your hair or face. If it is a cold day you can throttle back on the motor power, or turn it off, and heat up a bit by pedalling, whatever makes you comfortable. The fact that there are many models to choose from, which include bikes suitable for an uphill climb even on a rainy day in Wellington, makes them also more likely to find an expanding market here, and as the manufacturers now have their focus on the 60 plus instead of the 20 year olds it is likely that we shall see a whole new spectacle of Senior Bikers mounting up. Meanwhile, I note that a number of our Councils around the country including Palmerston North, Hamilton, New Plymouth, Nelson and Auckland Transport among others have picked electric bikes for their use. So for your next trip to the post office or the dairy or the office hop on you el-bike! This entry was posted in Tech-Trends and tagged Electric bicycle by Thor. Bookmark the permalink.